This is the campaign log for the Nineteenth session of a google+run Wandering Heroes of Ogre Gate campaign. The previous session is described HERE. Last session the party had continued its dealings with the sisters of Bone Kingdom. San went with the middle sister, Dawa, to kill Binying (the eldest sister) and secured her Talisman. 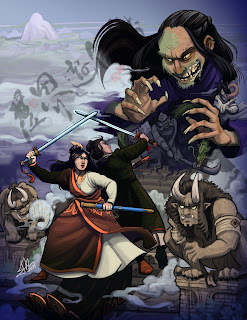 Chen had fallen in love with the youngest sister, Liling, and was warned by Dawa to make her take an oath before the Emerald Monk not to harm him (if he intended to marry her). They returned to the inn and Chen met with Liling before the Emerald Monk, where she vowed not to harm him and he promised to give her the other Phoenix Talismans if she helped him deal with the invading army. Liling said she could unleash a plague upon them, but it would require some small deed on his part. Chen felt he needed to think on the matter so he asked for a couple of days to give his decision. Later he spoke with Dawa, who had agreed to help him deal with Qinwen. She said if he could secure her the Immortal Killing Sword, he might be able to present her as a prisoner to Qinwen (which would settle the grudge between Heaven Palace Sect and Bone Breaking Sect). She could then kill him from the inside. In the meantime San investigated the nature of Liling. She came to the conclusion that the sister was using some sort of enchantment on Chen, and she worried others in the party might have been affected but concealed it to deceive the group. Chen researched the matter of the Immortal Killing Sword and also looked into potential nearby allies in the region. He learned that the sword was at the Temple of Supreme Righteousness, not two days away. He also learned that the Kushen had united into a large army under the leadership of Gal Ganbaatar Khagan. Chen sent out several messages, including one to Gaanbatar suggesting a joint attack on Li Fan and one to The Temple of Supreme Righteousness asking for a meeting. Days later, Leaders from the Temple of Supreme Righteousness arrived in response to Chen's message. They brought the Immortal Killing Sword and were willing to exchange it for the two Phoenix Talismans. However they made him promise not to use the sword for evil purposes. Word also reached Chen that the Li Fan army would invade in 15 days. He decided to move his people out of the inn before that time, and also sent out word that the inn was for sale. While Chen met with the leaders of the temple, San decided the only safe way to deal with Liling was to put together an all-female team and assassinate her during the day. She called the Flying Phantoms to send five of their best. When they arrived, she told them she needed their help killing Liling. She went to Bone Kingdom with the five Flying Phantoms, One-Armed Fiery Demon and Fearless Cat. They also took Sand Demon with them but instructed him to remain away from the caves and not approach Liling (they were pretty confident he wouldn't succumb to her charms but wanted to be careful). Chen brought Dawa to Qinwen, giving her the Immortal Killing Sword (which she was able to absorb into her body to conceal). Qinwen allowed him into the Jade Hall and was pleased with the offering. He told Chen that their grudge was settled. When Chen returned to the inn, the strange plague of trees was gone. San reached Bone Kingdom and they broke into Liling's cave. They found her in a hall with one of her dogs and immediately attacked. She resisted, unleashing a powerful gust of blue energy against the group, but was overwhelmed by their numbers. They killed her and searched the complex. They found the Talisman in her room (taking it). San also took Lilings Golden Moon Pins. Finding her Library they took some books on music and a book by Liling about Bone Kingdom. San returned to the inn the same day as Chen. She told him about Liling and they were able to convince him that he had been under an enchantment. Chen sold the inn to Master Pei for 250,000 spades. He also sent men to guard the Salt Mines (their most valued possession). The group retreated to Qui Pan Fortress in Dragon Tail Mountain, where they received word that the leader of the Kushen, Ganbaatar had received their message and brought his forces into Li Fan. They were invited to his camp and agreed to work together to defeat the King of Fan. Ganbaatar would take the capital and in exchange he would allow Bone Breaking Sect to continue its operations in the southern lands without interference. Ganbaaar's Wife, Alaqa, who was a Commander of Ten Thousand (a Tumen), would join the PCs in an attack (along with eight other units of Ten Thousand) against the Li Fan forces as they headed south to the Inn (while Ganbaatar would take his main force to the city of Fan and defeat it while it was under protected. However when Alaqa's army approached, the Li Fan soldiers reacted quickly and nearly fended them off, resulting in in several set-backs for the Kushen. Chen and San tried to boost moral by leaping into the fray, taking out commanders with their Kung Fu. This raised spirits and the army was able to recover and defeat Li Fan.